I think. I don’t know enough of them to know. But I do think this stuff is worth knowing more about because they all feel like unstoppable strands of the near-future. They all feel like the internet did twenty years ago – yes you’ve heard of them, you know people are doing stuff with them but what really is that going to do for me? And the combinations with other technologies are quite hard to think about because of this. Even fifteen years ago the people saying that the future of the internet was mobile phones seemed to be few, probably right, but possibly nuts. Here’s what I think is interesting about each. 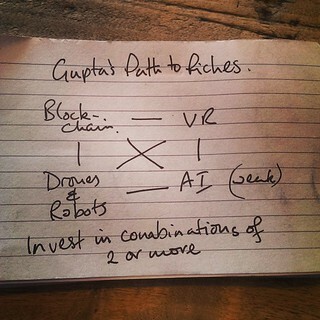 Drones & Robots: I heap these together with devices on the network whose primary function is not computing (or computing as we know it) they are machines that do stuff for us and replace some part of undesirable human labour, ultimately allowing us to do stuff we just could barely imagine before. Artificial Intelligence: the “weak” modifier is important here, we’re not talking about sentient computers, rather things like voice recognition, machine translation, helpers like siri. This is the software version of human-replacing robots. Get a machine or a network of machines to replace some thinking-like function: decision making or sensory recognition or pattern matching. Blockchain tech has started off by replacing currencies, but it’s becoming clear that the generalised form of bitcoin – a distributed ledger that gets its authority from the consensus of the network is a candidate for replacing all sorts of centralised databases and thus making all sorts of human activities in firms look horribly inefficient and redundant. The best corporations may turn out to have been relatively inefficient cyborg machines weighed down by their meatware compared to a Decentralised Autonomous Organisation. Within these silos, each of these technologies are on the road to being mainstream – it’s those combinations that make me think. A robot that senses and makes decisions about its environment through a virtual reality interface but ultimately controlled by a DAO sounds Terminator-ish. Well, what I’m asking now is “What if we all have to do that?” What if we make a huge leap in replacing types of work? What if, in the British economy, we made things that made our Financial and Professional Services as “not economically viable here” as coal-mining, steel work or mass manufacturing – the things that were the cornerstones of our economy when I was a child? How’s it all going to work out? Is this all what we really want? Would knowing how the world is now have helped us at all forty years ago? Can we just pause and check? I think we need to talk a lot more about these things. Tuttle is one place, but I’m going to be making time for other ways to engage over the next few months. Please join me. There’s a lot in that post. I definitely think coming up with alternative models for work (and/or politics, economics … etc etc!) is necessary. And how to pay people who are not “working”. Personally I like minimum guaranteed income, but with our current models that is very unlikely! Thanks Patrick, it was all in my head and I feel very relieved to get it out, even if by choosing the title I earwormed myself with Johnny Dankworth’s theme tune…. The resistance to minimum guaranteed income is interesting, it’s very threatening to many people’s worldview, I think we’re going to need lots of baby steps along the way. Given the political difficulties over benefits in a world of austerity, I find it hard to envisage what the baby steps would be. Before the election, I read one of the big reports on basic income from think tank – possibly the Rowntree Foundation. Even advocates thought it wouldn’t be possible because of lots of unintended consequences and a badly designed welfare system. One notable finding was that the worst off might actually be better off under the current system.